Australia Day calls for some traditional food offerings, and they don't come more traditional than damper. 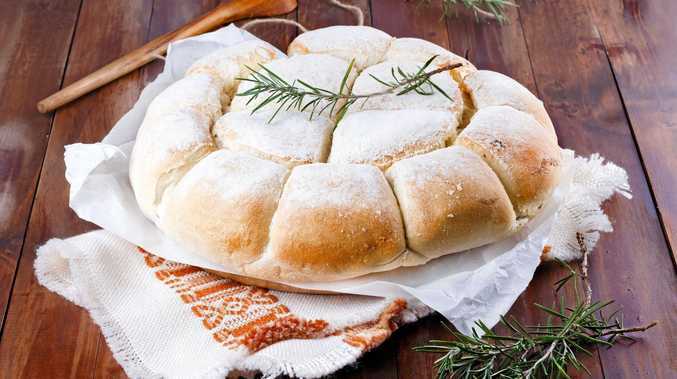 This easy bread usually has only four ingredients and was a favourite for drovers and swaggies. Versions of damper exist worldwide; in Ireland, for example, it's called soda bread. Those on the move usually cooked damper in the coals of a campfire or, if one was available, in a greased camp oven. It was easy to carry the ingredients and, as we all know, there's nothing better than hot, freshly baked bread. You don't need to build a fire to cook damper; a hot oven will do the trick, although it will lack the authentic taste (and occasional grittiness) of wood ash. Golden syrup is the accompaniment of choice; however, I have added chopped fresh rosemary leaves to this recipe for an aromatic savoury version. Just a smear of unsalted butter would be perfect. Preheat oven to 190C. Combine flour, salt and rosemary in a large bowl. Add cubed butter and rub it into the flour with your fingertips until it resembles breadcrumbs. Make a well in the centre and stir in milk with a wooden spoon until a soft dough forms. It shouldn't be sticky; add a little more flour if it is. Turn out on to a floured work surface and knead gently until smooth. Form into a ball. Place on a lightly greased and floured baking tray and flatten gently; cut into sections partway through and brush with a little milk. Bake until golden and it sounds hollow when rapped with a knuckle. Serve warm with extra butter.